• Combine the vegetable stock, salt, brown sugar, peppercorns, allspice berries, and candied ginger in a large stockpot over medium-high heat. • Stir occasionally to dissolve solids and bring to a boil. • Then remove the brine from the heat, cool to room temperature, and refrigerate. • Combine the brine, water and ice in the 5-gallon bucket. • Place the thawed turkey (with innards removed) breast side down in brine. • If necessary, weigh down the bird to ensure it is fully immersed, cover, and refrigerate or set in cool area for 8 to 16 hours, turning the bird once halfway through brining. • Adjust a rack to lowest position and remove other racks. • Dry bird well with paper towels, inside and out. • Mix together parsley, rosemary, sage and thyme. • Rub the bird with the herb mixture inside and out. • Stuff the onion, garlic, herbs, and bay leaves inside the breast cavity. • Set the bird on a roasting rack in a roasting pan; breast side up and brush generously with half the butter. • Tent the bird with foil. • Roast the turkey for 2 hours. • Remove the foil and baste with the remaining butter. 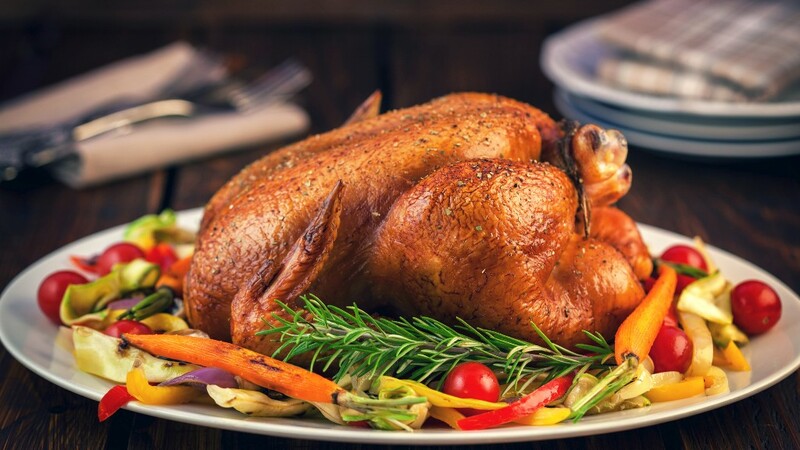 • Increase oven temperature to 425 degrees F and continue to roast until an instant read thermometer registers 165 degrees F in the thigh of the bird, about 45 minutes more. • Remove turkey from the oven and set aside to rest for 15 minutes before carving.